show. I then found a triangular Tibetan prayer box. I have to list them and find home for them quickly because now I have three. You know that old collectors' saying "Once you have three of them, you have a collection...." Oh no!! This one is sterling silver filigree set with red coral and turquoise. It has Buddist symbols done in turquoise and the coral. Very nice work! I will be offering it in my One Kings Lane shop. I will let you know when it is coming up for sale. This piece has a repoussé design of the Hindu God Ganesha. This one is also going to be first available in my One Kings Lane shop. I will also alert you when it will go for sale. This piece has a lid at the top of the box and is complete with original. It is available on my website, HERE. A Gau ( can also spelled Ghau or Gao) is a Tibetan Buddhist prayer box or amulet box, usually made of metal and worn as jewelry. Often found in sterling silver with a gold wash, they are also found in brass and alpaca. I have even seen some pictured in gold. These containers or boxes are used to hold sacred amuletic objects such as crystals, prayers, photos or as a reliquary. They vary in size and the lid can be hinged or not. 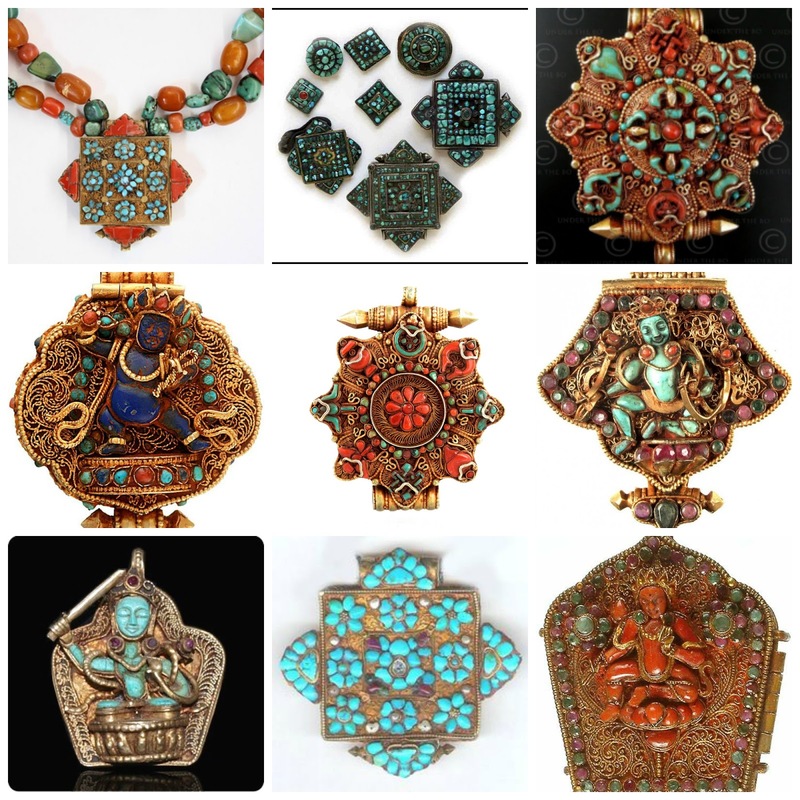 They can be simple or elaborate, with precious or semi-precious stones and are often decorated with Auspicious, Buddist, or Hindu symbols or mantras. 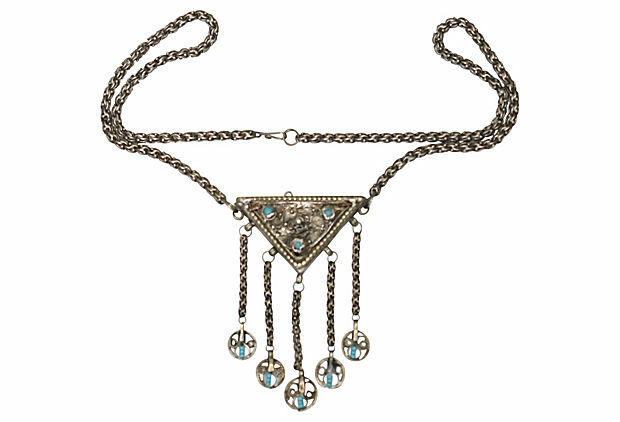 This sort of thing is very popular with the Boho, Hippie or Gypsy style and perfect to wear to the next music festival. So, I started searching the web for more examples, just because I need to learn about them, not because I am feeling the need to collect then, because I am not, I am not going to collect these, nope....but I collected some photos and made a collage. Aren't they beautiful?